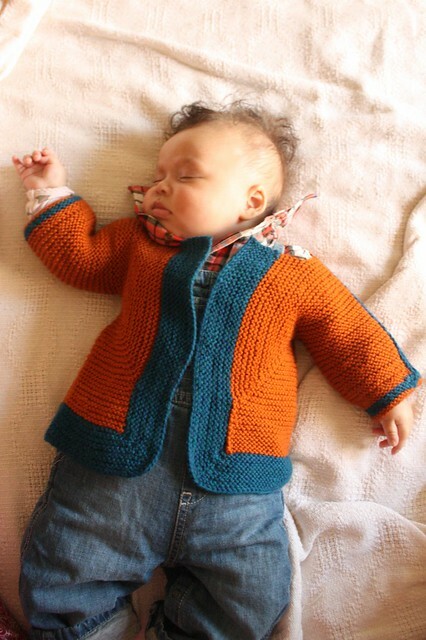 There's nothing like a hot summer day to snuggle your baby in a ... really warm wool jacket. Er. 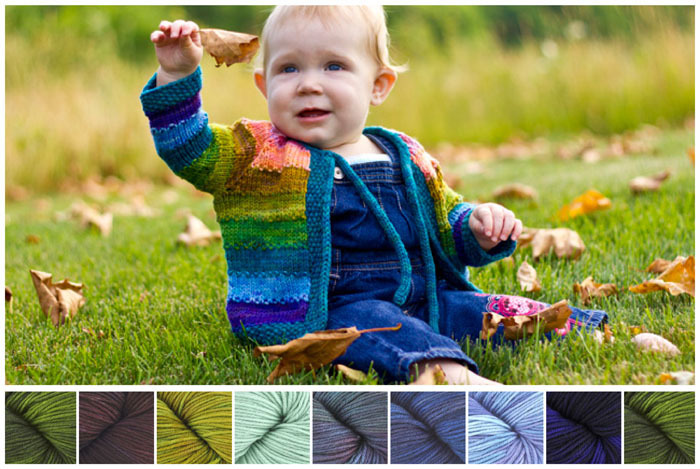 Anyway, I knit this little garter-stitch cardigan for a friend who had a baby boy last week — she's bringing him over this evening and I can't wait to meet him! I'm hoping it's big enough that he can wear it in the fall. This is the first time I have EVER made anything more serious than a hat for someone ELSE's baby, but said baby's mom is a knitter herself, so I know she'll appreciate it in the way only a fellow maker-of-garments-that-take-forever-and-ever-to-make can. 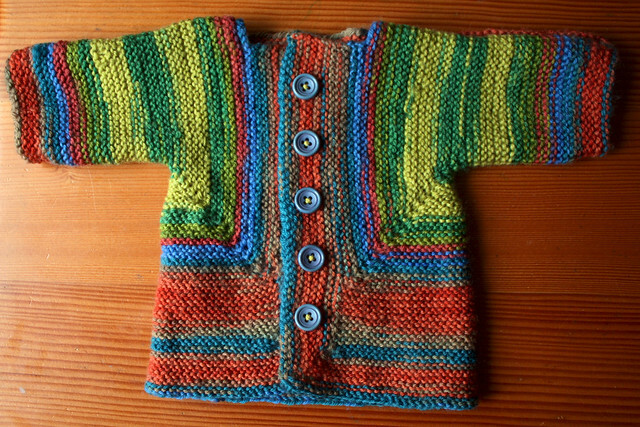 The pattern: Elizabeth Zimmerman's famous Baby Surprise Jacket from Knitting Workshop. 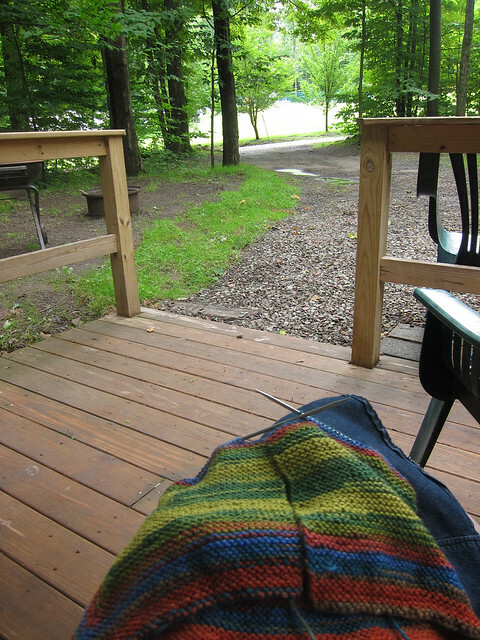 I knit with a worsted yarn in hopes of achieving a 3-6 month size for this fall/winter. The yarn: Classic Elite Liberty Wool, a fabulous soft squishy self-striping washable wool, purchased on my birthday trip to the Hub Mills yarn store. 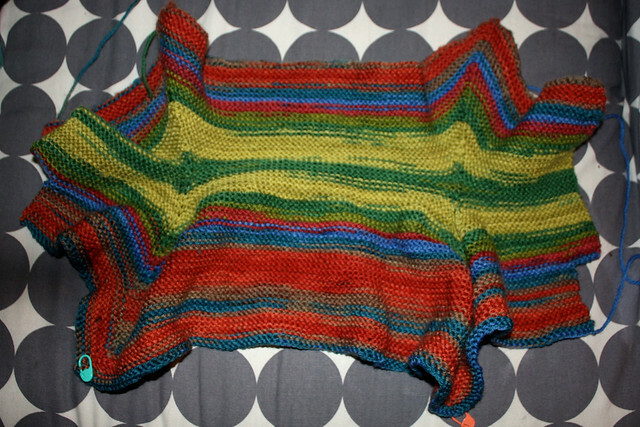 Time taken: A month (but I was knitting and making lots of other things at the same time). The exhaustive Ravelry details: Here. And then you do some origami magic and seam up the shoulders, and surprise! It's a jacket. I actually made one for Z three years ago when I wasn't nearly as confident a knitter... and totally left off the buttons and buttonholes. Oops! In sum: pure baby sweater happiness! In other cardigan current issues, I'm still knitting the fantastic chevroned Delancey cardigan for myself (try-on photos soon)... but I have another urgent unselfish baby sweater to make first, as I'm attending a baby shower in just a month to celebrate the impending arrival of my niece-to-be! 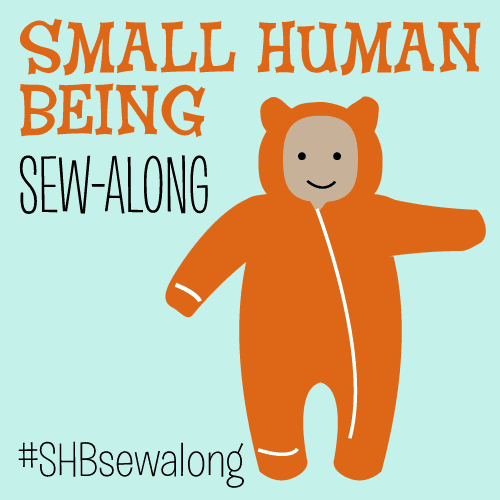 Luckily my niece-to-be will reside in Maine, so she'll have an endless need for warm wooly things! Oh my gosh, you're reminding me that I'm behind on a few baby gifts! I used to make exclusively gifts for other people, back in the days before I was massively obsessed with sewing! 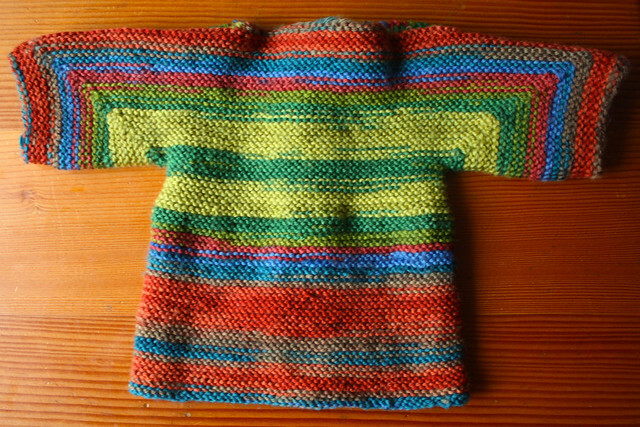 I love baby Z's version even without the buttons, but the little I know about babies tells me their clothes rarely stay put even with so-called fastenings! How long did she manage to keep it on for at a stretch? The new version is extra cute, though. I'd never have thought to use all those colors together, but they're beautiful. Would you be interested in posting it on Kollabora, the crafting site? I'm trying to increase appreciation of super-hip baby clothes (and maybe bias trends in favor of my personal taste in sweaters). Delancey Try-On: Too Snug or Just Right?